Christmas is a magical time of year, but it can also be stressful. Presents, decorations, and other festive extras to ensure you have a very merry Christmas can put enough of a strain on your budget, before you even consider food. Not to worry, because Christmas lunch doesn’t have to blow your budget. In fact, doing Christmas lunch for under $100 can be equally delicious, filling, and memorable. 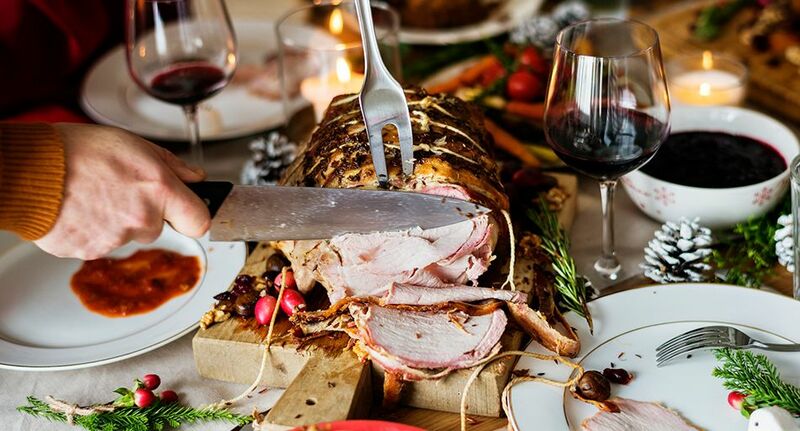 Fit to feed 8-10 people, these two tasty Christmas lunch ideas for under $100 should suit any taste or timeframe, leaving you to have a joyous, jolly Christmas. If you’re a traditionalist, our first lunch plan might be the meal for you. Although this plan requires more cooking/preparation time, it’s well worth it in the long run for both the taste, and all the leftovers it makes. Remove the turkey from the plastic packaging, but leave it wrapped in the foil provided. Place the turkey into a baking dish and add 1/2 cup of water. Roast the turkey roll for 50 minutes before removing the foil. Baste with a small amount of oil to help the turkey brown. Place the turkey back into the oven for the remaining 40 minutes. Allow the turkey to rest for 10 minutes before carving. Tip: Your turkey is cooked when the juices run clear after piercing it, or when the internal temperature reaches 82C. Use paper towel to pat dry the pork rind before rubbing the salt and oil onto the rind. Place the pork in a large baking dish and bake for 30 minutes or until the rind starts to crackle. Reduce the temperature to 180C and bake for a further 1-1.5hrs. Remove the pork from the oven and allow to rest for 10 minutes before carving. Tip: If your rind hasn’t crackled enough near the end of the cooking time, turn the heat back up to 230C for the last 10 minutes. Place the chicken, breast side up, in a large baking dish. Cut the lemon in half, place half the lemon inside the cavity of the chicken and juice the remaining half. Combine the lemon juice with the oil. Brush the lemon mixture over the chicken and season with salt and rosemary. Roast the chicken for 1.5-2hrs, basting it with pan juices every 30 minutes. Remove the chicken from the oven and allow it to rest for 10 minutes before carving. Tip: Your chicken will be cooked when the juices run clear after piercing the thigh with a sharp knife. With the cut side down, make thin evenly spaced cuts about 3mm apart to near the base of the potato. The cuts should not go through the base of the potato. Transfer potatoes to a baking tray lined with baking paper. Combine the oil, garlic and rosemary in a small bowl. Drizzle the mixture over the potatoes. Roast for 1 hour, turning occasionally. Steam the carrots until they are tender. Combine the honey and butter in a large frying pan over medium heat, stir until the butter has melted. Place the carrots in the frying pan in a single layer. Gently coat the carrots in the glaze. Serve. Tip: If you would like your carrots crispier, increase the heat for a few minutes and turn the carrots to avoid burning. Beat the egg whites and salt with electric beaters until the eggs become frothy. Continue beating and gradually add the sugar, 1 tbs at a time, until all the sugar has been added. Continue to beat the mixture until it has become thick and glossy and you can’t feel any grains of sugar in the mix. Reduce the beater speed and mix in the vanilla, cornflour and vinegar. Mix until well combined. Spoon the meringue onto a baking tray lined with baking paper and shape how you wish. Turn the oven off and leave the door slightly ajar. Leave the pavlova to cool inside the oven until the oven goes cold. Top the pavlova with the cream and fruit of your choice before serving. Tip: It’s easy to get a round pavlova if you draw a circle onto the baking paper first. Simply draw the circle and then flip the baking paper over before placing it onto your baking tray. This way your meringue won’t touch your pencil/pen marks. Mix together the mixed fruit, water, sugar and butter in a saucepan over low heat. Stir until the butter melts, then bring to the boil. Reduce the heat and simmer for 5 minutes. Stir in the bicarb soda and remove from the heat. Set aside to cool completely. Once the mixture has cooled, stir in the egg, flour and spices. Spoon the mixture into a greased pudding bowl and clip on the lid. Carefully lower the pudding bowl into a big pot of boiling water filled to 2/3. Simmer with the lid on for 4 hours. Lift the pudding bowl out of the pot and cool to room temperature. Refrigerate until needed. To heat the pudding up, you can boil it again for an hour or you can turn it out onto a plate and microwave individual pieces. Serve with cream and custard. Tip: Tie a piece of string to the pudding bowl to form a handle, this will make it easier to get the pudding bowl in and out of the boiling water. If you need to add more water during the cooking process, it is best to top it up using boiling water from the kettle so the temperature doesn’t drop. Place the custard powder and sugar into a saucepan. Blend with 1/3 cup of milk to make a smooth paste. Gradually add the remaining milk, whisking well. Slowly bring the custard to the boil, stirring continuously. Reduce to a low heat and simmer for 1 minute. If time is of the essence but you don’t want to sacrifice taste, then lunch plan #2 might be perfect for you. Requiring much less kitchen and preparation time than lunch plan #1, this meal still packs a mighty punch in the flavour department. Combine the sugar, honey, mustard and butter in a saucepan over low heat, stir until the butter has melted and the sugar has dissolved. Set aside. Use a sharp knife to cut through the ham rind 8-10cm above the shank. Use your fingers to gently lift the rind away from the layer of fat underneath. Discard the rind. Score the fat to make a diamond pattern and wrap the end of the shank in alfoil to prevent it burning. Place the ham in a large baking dish and brush 1/3 of the glaze all over the layer of fat. Reserve the remaining 2/3 of glaze. Bake for 30 minutes, then remove the ham from the oven and brush on another 1/3 of the glaze. Cook for 20 minutes, before basting the ham with the last 1/3 of the glaze. Cook for a further 10 minutes, then remove the ham from the oven. Allow the ham to rest for 10 minutes before carving. Arrange the lettuce, prawns, eggs and bacon on a serving platter. Drizzle over the homemade mayonnaise or serve it on the side. Cut the potatoes into pieces (you may peel them if you’d prefer), and steam for 10 minutes or until tender. Cut the cooked potato into bite sized pieces. Combine all ingredients in a large bowl and stir through the warm potatoes. Place the egg, salt, mustard and vinegar into a small bowl and mix for 10 seconds until frothy. Add a tablespoon of oil and mix until incorporated. Gradually add the oil, a bit at a time and blend until incorporated after each addition. If you have a helper, they can pour the oil in slowly while you blend the mixture. Taste the mayonnaise and add more salt, mustard or vinegar to suit your preferred taste. Tip: If you over mix your mayonnaise or it’s a hot day, the mayonnaise may become runny. If this happens, put it in the fridge to cool down. Top the pavlova with the cream and fruits of your choice. Tip: It’s easy to get a round pavlova if you draw a circle onto the baking paper first. Simply draw the circle and then flip the baking paper over before placing it on your baking tray. This way your meringue won’t touch your pencil/pen.